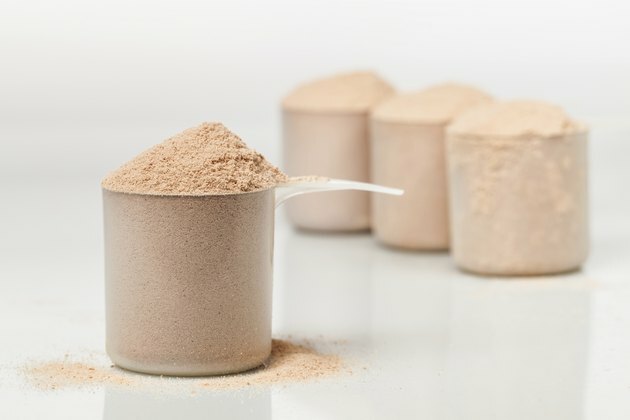 Although most protein powders are safe for almost everyone, they are dietary supplements that have not been approved or regulated by the U.S. Food and Drug Administration. Scientific research has tied several positive side effects to protein powder, especially to whey, but studies are ongoing to evaluate the potential negative effects of various protein powder sources as well. Some of the most popular protein powders on the market are made from whey and casein, both types of milk protein. Although milk protein powder concentrates and isolates naturally have less lactose than milk and most milk products, they can still cause digestive discomfort for people who have lactose intolerance. Whey and soy protein powders may also cause stomach pain, constipation or diarrhea if you take them in large amounts. Soy protein powder is a concentrated source of phytoestrogens, plant-based compounds that can mimic estrogen hormones in the human body. Moderate soy consumption is safe for most people, but high levels of phytoestrogens may increase the risk of certain cancers for both men and women. Specifically, a few studies have indicated that a high intake of phytoestrogens may increase breast cancer risk or breast cancer reoccurrence rates, although research on the subject is inconclusive. In a study published in 2010 by "Consumer Reports," researchers discovered that every sample of 15 different tested protein powders contained trace amounts of toxic heavy metals. Each sample tested positive for one or more of the heavy metals lead, cadmium, arsenic and mercury, and three samples were found to contain potentially toxic doses of the metals in three servings. Continued low-level consumption of such heavy metals can produce symptoms including fatigue, constipation, headaches and pain in muscles and joints. Protein powders may produce several positive physical effects. In a scientific trial published in 2011 in the "Journal of Nutrition," overweight subjects who took whey protein supplements experienced significant improvements in body composition, despite changing nothing else about their diets or lifestyles. Soy protein supplements did not have the same effect, which implies that the primary source of your protein powder may determine how much body fat you lose, if any. Additionally, if you work out with weights or do another type of resistance exercise, taking protein powder may have the effect of enhancing your performance. In a study published in 2013 in "Nutrition Journal," both whey and rice protein powder supplementation led to gains in strength, power and muscle mass among healthy subjects who trained regularly. DrAxe.com: Which Protein Is Better, Whey or Soy? What Are the Dangers of Whey Protein Isolate?